I made two “baskets” to take home for Fathers’ Day. Kind of like snickerdoodles with coconut and lime! Easy to make, soft and chewy, exotic taste! 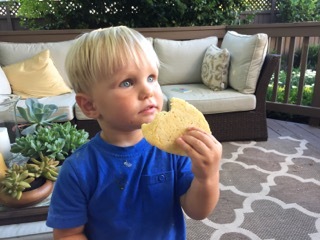 Here is our grandson, Hunter, enjoying one on the back deck. 1. Heat oven to 350 degrees. Line cookie sheets with parchment paper. Put a layer of coconut on a cookie sheet and bake it at 350 degrees for 5-7 minutes. Watch out. It goes from white to burnt really quickly if you aren’t watching closely. 3. Using a mixer, beat together butter and 1½ cup sugar until smooth and very fluffy. 4. Beat in egg, vanilla extract, coconut flavoring, lime juice and lime zest. 5. Gradually blend in dry ingredients and toasted coconut. 6. 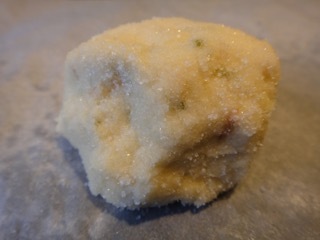 Roll 2 tablespoons of dough into a ball and roll in sugar. Place balls on lined cookie sheets about 1½ inches apart. These do spread quite a bit. 8. Bake 8 to 10 minutes in the preheated oven, or until edges are lightly browned. I used sweetened coconut and it worked fine. My patient was a thirty-five-year-old man who came in by ambulance. He had a condition called tardive dyskinesia. It is a movement disorder that can develop in some people, often a side effect of some psychiatric medications. He had the most terrible case I have ever seen. Whenever he was awake, he had uncontrolled movements of his entire body. Not just wiggling but actually thrashing. Every single minute, he writhed in bed, throwing his arms and legs around so much that we had to put pads on the side rails of the bed to keep him from injuring himself. He was a Kaiser member, and sees a neurologist who specializes in movement disorders. He is also a regular visitor to their emergency department. He ended up in our emergency department because, when the medics were called to his house, he told them he was so sick of his constant movement that he wanted to die. That prompted the police to put him on a psychiatric hold and all patients in our county that are on a psychiatric hold must come to our hospital. I had never before seen anything so severe. I ordered laboratory tests and got some information from Kaiser before I was comfortable that he didn’t have anything new or dangerous going on. I then formed a plan to help control his movements enough that he could go to the psychiatric emergency room. We did this by giving him injections of medications. One medicine, benztropine, is used for various types of movement disorders. We also give him lorazepam, which is a tranquilizer. When he got enough medicine, he finally quit moving and fell asleep. However, as soon as the medicine started to wear off, he started moving again. A little at first, then as soon as he was wide wake, the thrashing would start again. When he was settled down to what he said was his baseline, I sent him over to psychiatry. However, in a few minutes, we got a call from them saying they were unable to deal with his constant movement and were sending him back to us. I eventually had to admit him to the hospital to be seen by a psychiatrist as an inpatient. The bin I used to hold rolled-up straps to return them to the paramedics to use disappeared recently. I decided to make it more clear that the bin I provided was to be used for that specific purpose. 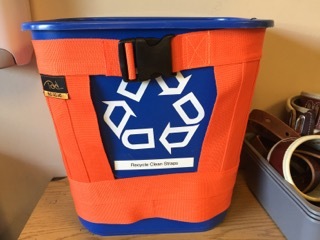 I bought a recycle can at Goodwill and decorated it with straps to make it clear that it was not a trash can. 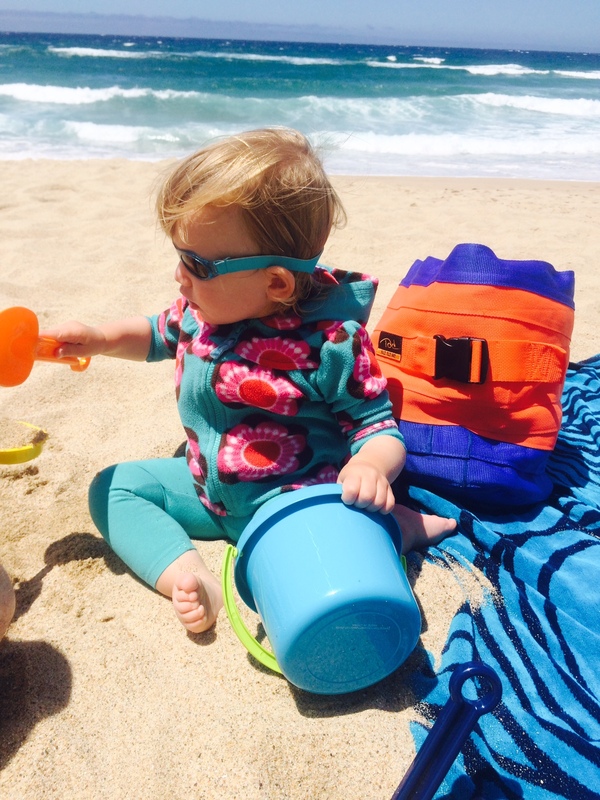 Sandra sent me this picture of Ellie playing on the beach by her Tad Bag. For years, our county Emergency Medical Services (EMS) has used the same yellow-green trauma straps. 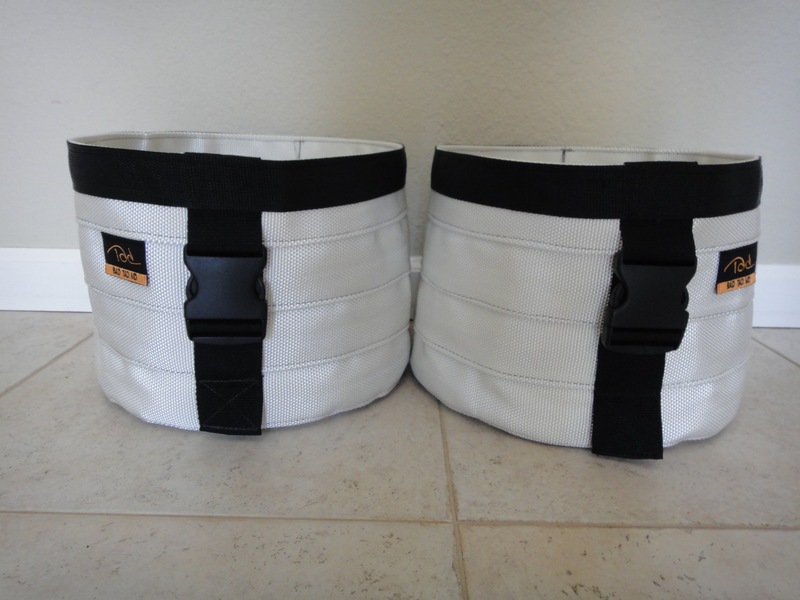 Recently, patients have been coming in with orange, black and lemon yellow straps. What a great inspiration for any bag maker! 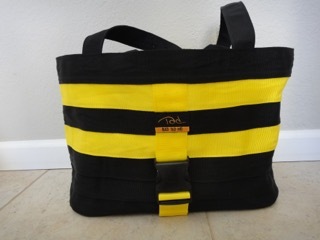 Here is a bumble bee bag I made out of some of the new straps. 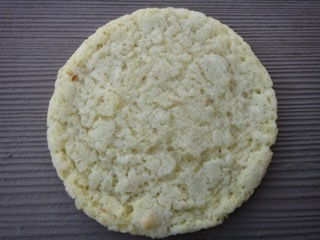 We bought a Snickerdoodle from a woman selling cookies at the Fourth of July celebration in Blanding, Utah a couple of weeks ago. They were buttery and soft and inspired me to make some of my own. 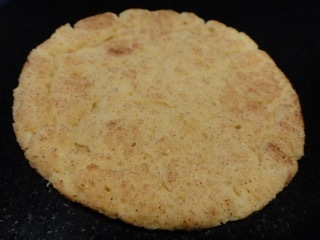 I went searching this site for my Snickerdoodle recipe, which I got from Peg, a nurse I worked with at Southeast Alabama Medical Center in Dothan, Alabama many years ago. I was surprised to see I had never posted it. I went ahead and made them and they were so good I decided to post the recipe. You can see from this that not every recipe I post has to have something weird like wasabi peas in it. What makes this recipe different? The half butter, half Crisco ratio and cream of tartar give them a great texture. If you like them softer, use all butter and bake at a lower temperature. 1. Cream together: butter, shortening, eggs, 1½ cup sugar and vanilla. 2. In a separate bowl, mix together flour, cream of tartar, baking soda and salt. 3. Blend both mixtures together. 4. Combine ¼ cup sugar and cinnamon. 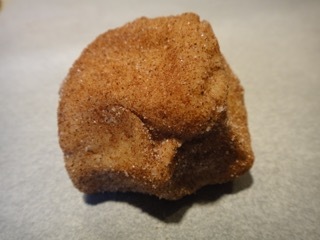 Form dough into balls and roll in cinnamon sugar. 5. Bake at 400 for 8-9 minutes. If you like them softer, use 1 cup butter, omitting the shortening. Bake them at 350 degrees until just browning on edges. We frequently have to decide if an elderly patient has an altered mental status. This can be a bit tricky because the patient might be a little “off” at baseline so sometimes, we have to try a little bit harder to determine if the patient is altered or not. The other night, the intern (doctor in training) told me an eighty-year-old woman was confused because she was not able to give the exact date. After meeting her, I asked her if she knew where she was and she named, exactly, our hospital. I asked her if she knew the date. She said, “No,” without even trying. When I pressed her, she gave the year, off by only one. I then asked her who was the President of the United States. “Obama,” she answered confidently. “Who is going to be the president next year?” I then asked. Since my purpose was not to delve into her politics, I stopped the interview there. If she knew those two facts about the man running for president, it was hard for me to believe she might have any significant confusion.